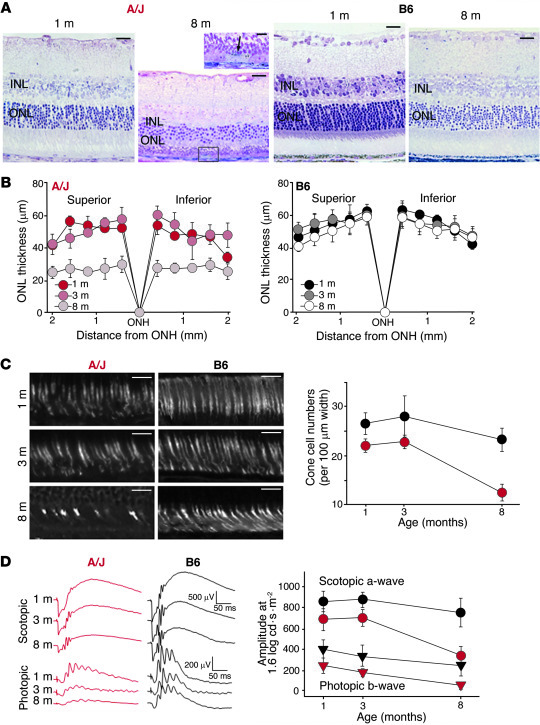 A/J mice display a pronounced age-dependent decline in vision. (A) Light microscopy of A/J mouse retinas revealed a marked decrease in ONL and inner nuclear layer (INL) thickness in 8- versus 1-month-old animals, as well as pathological changes in the RPE layer at 8 months of age, as shown by the higher-magnification view of the boxed region (arrow, pyknotic cell). These changes were minimal in B6 mice. (B) ONL thickness, plotted as a function of distance from the optic nerve head (ONH), showed the most pronounced decline occurred between 3 and 8 months of age, a finding that was absent in B6 mice. (C) Cone cell sheaths were imaged by PNA staining at 1, 3, and 8 months of age. Average numbers of cone cells in both the superior and inferior retina in a 100-μm range located 500 μm from the optic nerve head were plotted (red, A/J; black, B6). A/J mice showed a marked decline between 3 and 8 months of age. (D) Representative ERG responses at 1.6 log cd•s•m–2, and functional a-wave and b-wave amplitudes, obtained from A/J (red) and B6 (black) mice at 1, 3, and 8 months of age. ERG responses were more attenuated with age in A/J versus B6 mice under both scotopic and photopic conditions (P < 0.001). Scale bars: 20 μm (A and C).